Sanju Samson is one of the most exciting players on the cricketing field thanks to his many achievements that belie his young age. 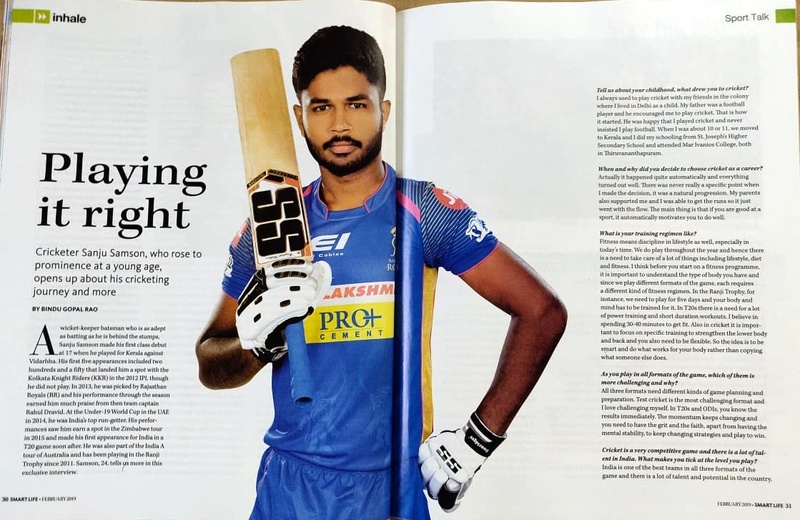 A wicket-keeper batsman who is as adept as batting as he is behind the stumps, Sanju Samson made his first-class debut when he was just 17 when he played for Kerala against Vidarbha. His five appearances included two hundreds and a fifty that landed him a spot in the Kolkata Knight Riders (KKR) in 2012 IPL though he did not play. In 2013 he was picked up by Rajasthan Royals (RR) and his performance through the season earned him much praise from the then team captain Rahul Dravid. Playing in the UAE in the Under-19 World Cup he was the top run-getter for India. His consistently good scores saw him earn a spot in the Zimbabwe tour in 2015 and he made his first appearance for India in a T20 game soon after. He was also part of the India A tour of Australia as well as has been playing the Ranji trophy since 2011. The 24 year old tells us more in this exclusive conversation. Tell us about your growing years, what drew you to cricket? I used to always play cricket with my friends in the colony where I lived in Delhi as a child. My father was a football player and he also encouraged me to play cricket so that is how it started. He was happy that I played cricket and never insisted I play football. When I was about 10-11 years old we moved to Kerala and I did my schooling from St. Joseph’s Higher Secondary School and college from Mar Ivanios College both in Trivandrum. When and why did you decide to choose cricket as a career? Actually it happened quite automatically and everything turned out well. There was never really a specific point when I made the decision, it was a natural progression. My parents also supported me and I was also able to get the runs so it just went with the flow. The main thing is that you are good in a sport it automatically motivates you to do well. Fitness means discipline in lifestyle as well especially in today’s time. We do play throughout the year and hence there is a need to take care of a lot of things including lifestyle, diet and fitness. I think before you start on a fitness program it is important to understand the type of body you have and since we play different formats of the game, each has a different kind of fitness regimen required. In the Ranji trophy for instance we need to play for five days and your body and mind has to be trained for it. In T20’s there is a need for a lot of power training and short duration workouts. I believe in spending 30-40 minutes to get fit. Also in cricket it is important to focus on specific training to strengthen the lower body and back is very important and you also need to be flexible. So the idea is to be smart and do what works for your body rather than copying what someone else does. As you play in all formats of the game, which of them is more challenging and why? All three formats need different kind of game planning and preparation and test cricket is the most challenging format and I love challenging myself. In T20’s and ODI’s you know the results immediately. The momentum keeps changing and you need to have the grit and the faith apart from having the mental stability to keep changing strategies and play to win. Cricket is a very competitive game and there is a lot of talent in India. What makes you tick at the level you play? India is one of the best teams in all three formats of the game and there is a lot of talent and potential in the country. Everyone can hit a ball and bowl perfectly and that is what keeps the competition and standard of cricket going. We need to understand that it is important to analyze your last game and see how you can improve on your flaws rather than focus on others. How important is to have a good mental attitude in a high pressure sport like cricket? What do you follow? If you play cricket in the right way, you can also grow as a good human being. For me meditation and yoga helps quite a lot. I also interact with my seniors in Rajasthan Royals like Rahul Dravid and Shane Warne as well as my coaches who share valuable tips on how you can develop a good mental attitude. What kind of diet do you follow to stay fit? I used to follow a low carb high protein diet that helped me perform well. I feel this diet has helped me both physically and mentally. What do you like to do when not playing? I like to spend time with friends and family as otherwise I keep busy so I really look forward to spending time with them. What is your advice to aspiring cricketers? My advice would be that the focus must be on improving the game. Youngsters are more into getting results but it is something that is not in your control. You must first set goals of learning cricket and the sport itself instead of focusing on getting into the IPL team or make it to the national team. Mastering the sport is the first thing according to me. What has been your most important cricketing achievement to date? There have been quite a few like playing with Rahul Dravid, facing Sachin Tendulkar and AB De Villiers but when I got selected to play for the Rajasthan Royals for the first time I was just 18 has to be a big achievement for me. 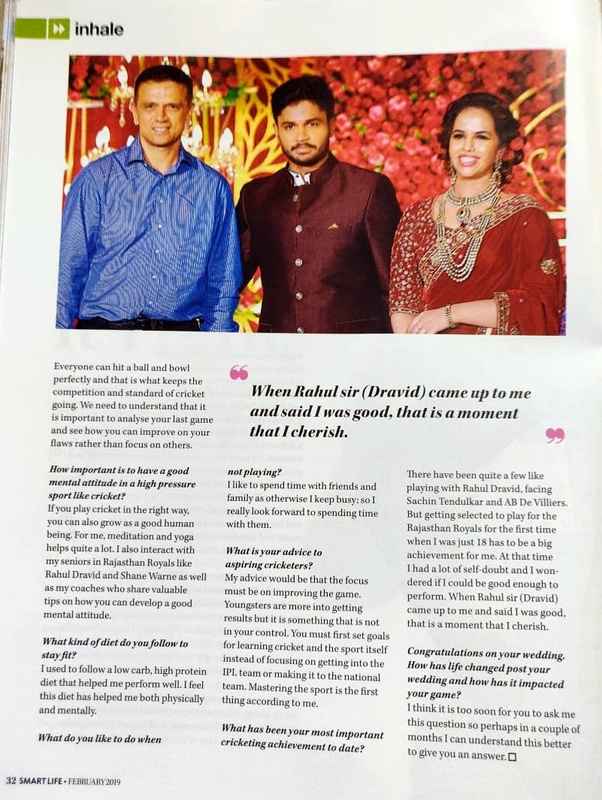 At that time I had a lot of self-doubt if I could be good enough to perform and when Rahul Sir (Dravid) came up to me and said I was good and could play it was a moment that I cherish even to date. Congratulations on your wedding. How has life changed (if at all) post your wedding and how has it impacted your game? I think it is too soon for you to ask me this question so perhaps in a couple of months I can understand this better to give you an answer. Previous Previous post: How to have good spinal health? contains plenty of useful facts, thanks for providing these kinds of data.